"This is excellent served with pulled pork. Its a nice mix of sweet, tangy, and crunchy." Mix coleslaw mix, pineapple, and onion together in a bowl. Whisk mayonnaise, vinegar, brown sugar, cilantro, salt, and pepper together in a bowl until dressing is smooth. 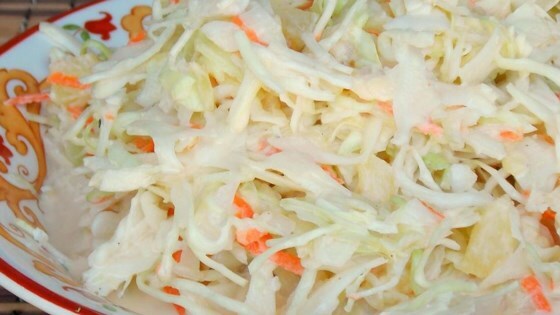 Pour dressing over coleslaw mixture and toss to coat. Refrigerate. Good enough to serve to guests. I thought the marinade was not quite enough. Perhaps doubling the dressing would be a good idea. I omitted the onion and added just a little shredded ginger.. yum.. I used a red onion and parsley instead of the cilantro.